In this area of the Apparel Search fashion brand directory, you will find men's fashion brands from leading apparel companies and fashion designers. On this particular page, you will find information regarding men's clothing with the Jockey brand. You are welcome to utilize this section of our clothing guide to review Jockey news, Jockey blog posts, Jockey photos, and more. Please understand that you may run into a few photos or a tad of information that does not actually pertain to the men's Jockey fashion brand. Unfortunately, no search technology is absolutely perfect. We will continue to do our best to bring you as much information about the men's Jockey fashion collection as possible. The fuel for Jockey’s growth continues to be a stream of differentiated and innovative products. Jockey’s legacy of innovation began in 1934 with the introduction of the first men’s brief. Today, among other innovative products, Jockey markets the only phase change technology in the underwear category, provides sport underwear that is clinically proven to outperform competing products, and recently launched a bra collection based on a unique sizing technology which is protected by over 50 patents. 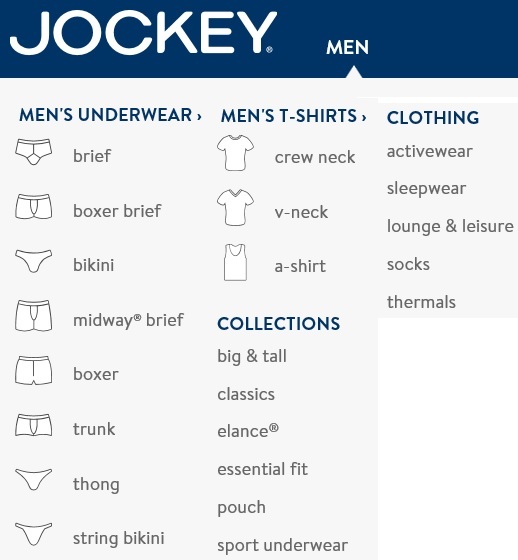 Jockey is the leading undergarment brand in the U.S. department store channel with major customers including Macy’s, Lord & Taylor, Belk, Bon Ton, JCPenney, and Kohl’s. In the U.S., Jockey has expanded distribution through related brands in Target and Wal-Mart. Learn more about the Men's Jockey Brand clothing. If you have changed your mind and do not wish to research the brand Jockey, you can use the search engine on this page to find another clothing label that may be of more interest. Apparel Search is a leading guide to fashion, style, clothing, glam and all things relevant to apparel. We hope that you find this Jockey page to be helpful.